In my first article about the 2013 Dey Dey‘s Ranch Open House, I wrote about going on the farm tour. In addition to Dey Dey’s Best Beef Ever running their farm tour all day, the event was also filled with speakers, vendors, and great food. 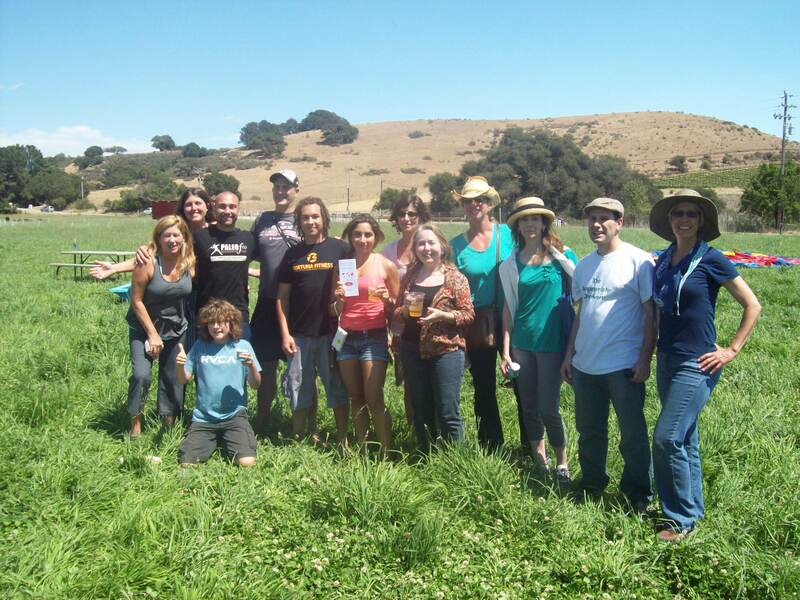 As the proceeds from Dey Dey’s Open House benefited the Farm-to-Consumer Legal Defense Fund and the Santa Ynez Valley Weston A. Price Chapter, many Weston A. Price chapter leaders and members attended the event. Within the last month, I became co-leader of the Pasadena Chapter, so it was wonderful being able to meet up with all of these other chapter leaders. It’s like one big family. Many of the chapter leaders also played a major role in the open house. Katie Falbo was the emcee for the event and spoke about selecting the right farmer. Victoria Bloch was among the presenters as she talked about people transforming their lives through eating healthy. And Melinda and Shelley had a booth for their Santa Ynez Weston A. Price Chapter. People could learn more about the WAPF and find out how to get involved. Their booth also held a raffle to raise money for their recently established chapter. They auctioned off books, T-shirts, DVDs, and Dey Deys products. 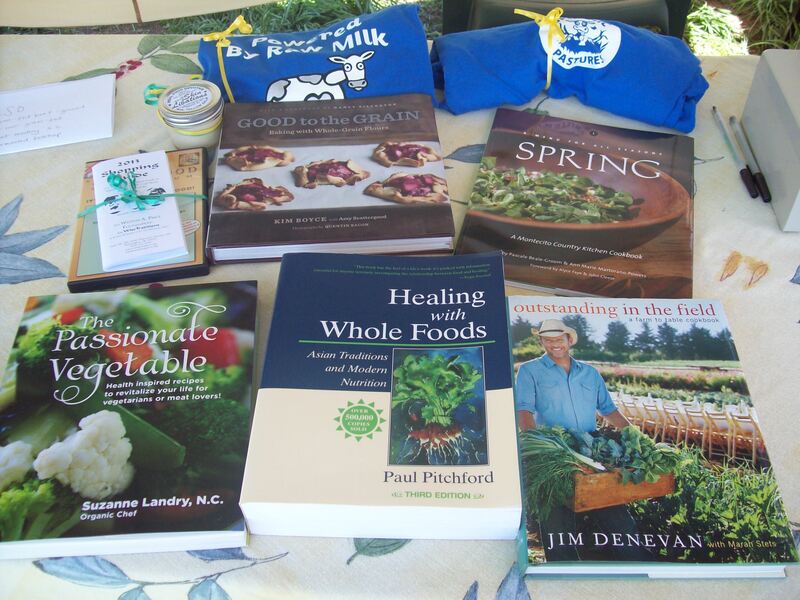 The books were great for both people wanting to jump into cooking nutrient dense foods and for the seasoned pro looking for new nourishing recipes. Leaders from other chapters helped out with the booth as well. People from all parts of southern California attended the open house, so having different chapter leaders at the booth, helped the open house attendees to learn specifically about the chapter in their area. The cooking classes were something new to the open house this year. 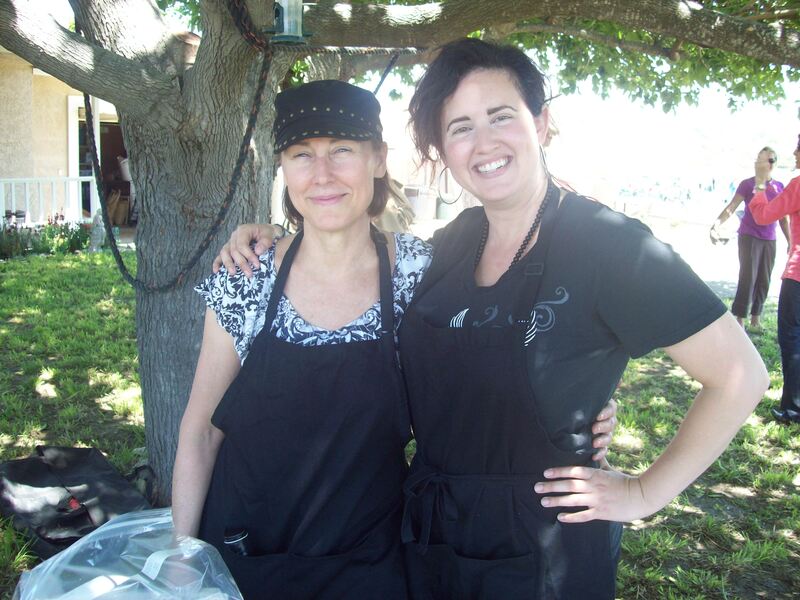 Straight out of the Pasadena Chapter, Culture Club 101 owner Elaina Luther and Real Food Devotee owner Monica Ford gave a demo on cooking bone broths. Elaina also taught how to make sweets for people on the GAPS Diet. And Monica gave a class on making moisturizing cream from beef tallow. What would a farm open house be without getting to taste some of its great food? Dey Dey’s ground beef was served with burgers you could custom make. Among the choices of condiments were sauerkraut and fermented ketchup from the Culture Club 101. Plus the buns were brioche, meaning lots of butter and eggs baked into them. 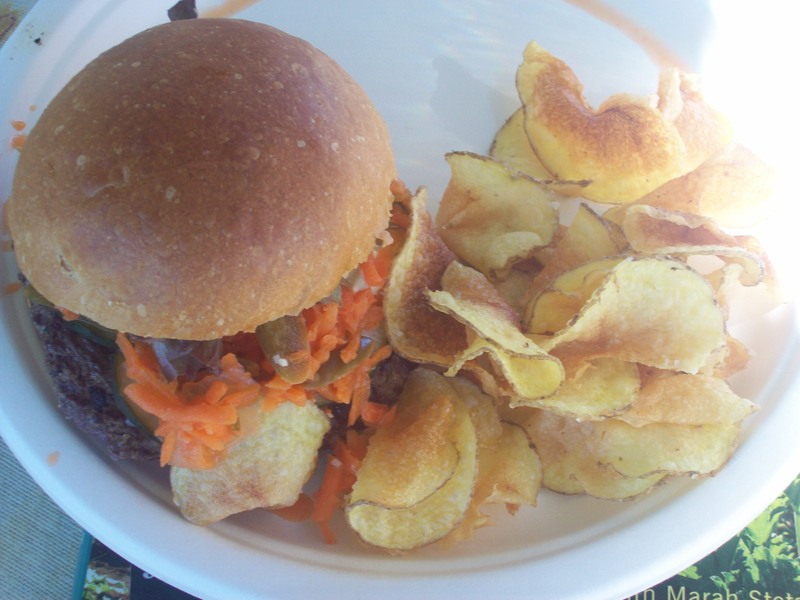 They also served some delicious potato chips cooked in beef tallow. It’s hard to find potato chips that aren’t cooked in rancid vegetable oils. The home made potato chips were a real treat. There was a great variety of drinks at the open house too. I opted for the honey lemonade. Lemonade without sugar is also a rarity. I’ve had some honey lemonades, but the honey can often be an overpowering flavor. 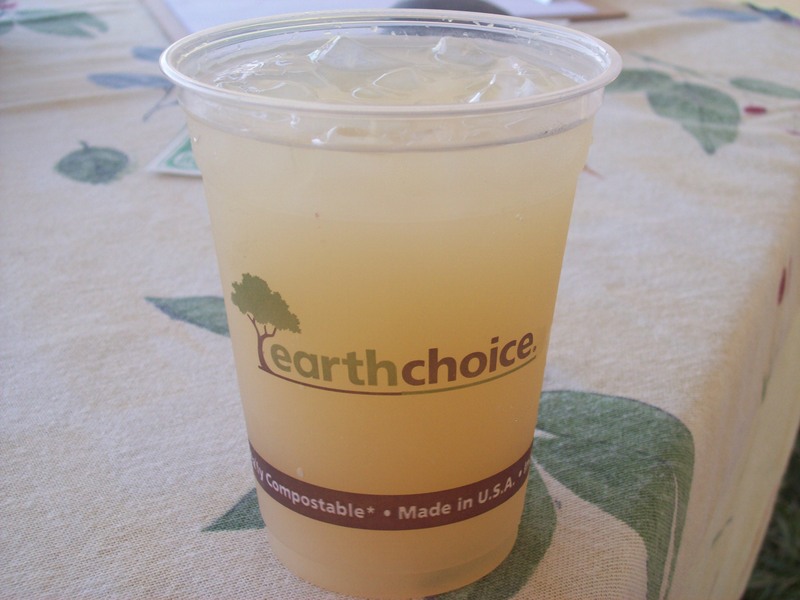 This honey lemonade was done just right and you could taste the lemons in it along with the honey. And for the dessert, attendees of the Dey Dey’s Open House could buy some almond milk ice cream from the Sugar & Salt Creamery. For people with dairy allergies, almond milk ice cream is a great alternative. Unfortunately, many of the almond milks on the market are heavily processed. The almonds are often sprayed with lots of pesticides, pasteurized, and not soaked nor sprouted. Then all kinds of additives, from carageenan to synthetic vitamins, are found in the grocery store almond milks. 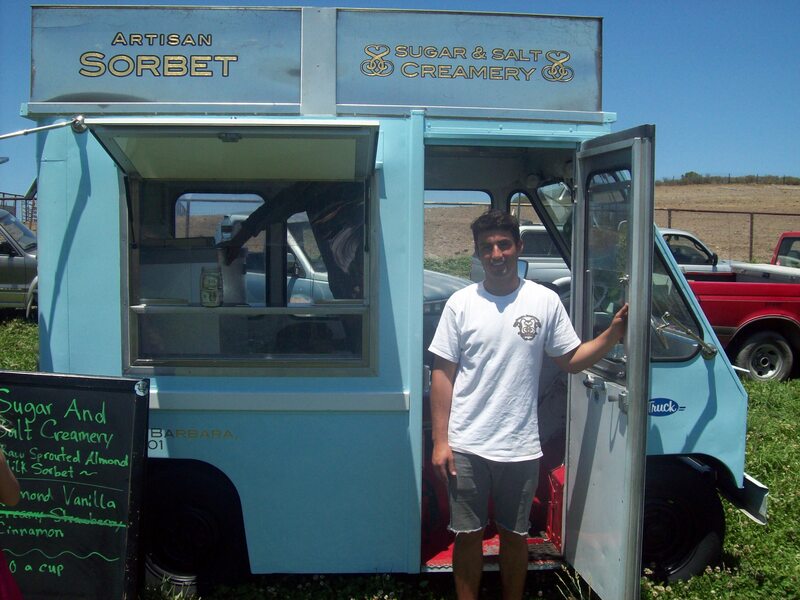 Sugar & Salt Creamery uses organic sprouted raw almonds and doesn’t include any hard to read ingredients in its ice cream. And their almond milk ice cream is quite tasty too.